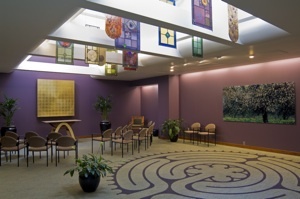 Jaan was commissioned to design the interior for two different chapels on the Mission Hospitals, Inc. campus in Asheville, North Carolina, from 2005-2008. Jaan has been working with the Pastoral Care Department, the architect on the project, and other representatives of Mission Hospitals, Inc., to design a space that will be a comfort to all visitors to the hospital. With this in mind, representatives of different faith communities in WNC were consulted on their members' use of Mission Hospitals, Inc. chapels. A survey was conducted among these groups. There were many common themes that emerged. These themes are being incorporated into the design of the new chapels. Jaan Ferree believes in supporting the work of regional artists. She has commissioned a ceramic artist, Rob Mangum, to create a water feature for one of the chapels. She also commissioned a stained glass artist, Marty Mitchell, to create special stained glass window with wide appeal to various religious and spiritual outlooks. To celebrate the emphasis on natural areas in the Asheville region, the stained glass Mitchell creates illustrates the mountains in different seasons and includes elements of nature. It is a reminder that the essence of life is change. Like the body itself, nature can renew and heal. William Everett, a retired minister and a woodworker with a studio in Waynesville, North Carolina was also commissioned to build the worship table, a journaling table, two kneelers, a bookcase, and a lectern for one of the chapels. Josh Bruton, a woodworker in Wester North Carolina, was commissioned to create hand-crafted furniture for the St. Joseph Campus Chapel. And Jessi Trevathan was commissioned to create a beautiful work of art that hangs on the wall behind the worship table at St. Joseph's Campus Chapel.